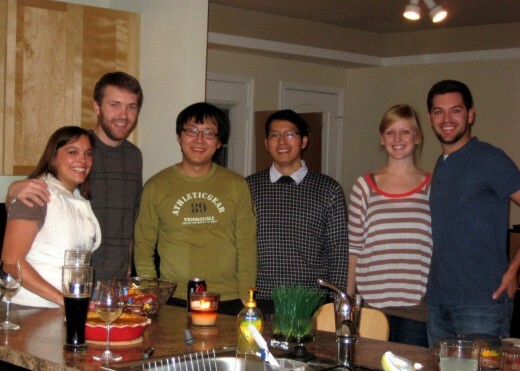 Four years ago, my husband and I decided to invite another couple over for dinner the weekend before Thanksgiving. Since we are always traveling to see our families over Thanksgiving and I never have the opportunity to prepare a turkey dinner, I immediately thought this is the perfect chance to make my first turkey. I went a little overboard and made several side dishes, along with pumpkin pie for dessert. 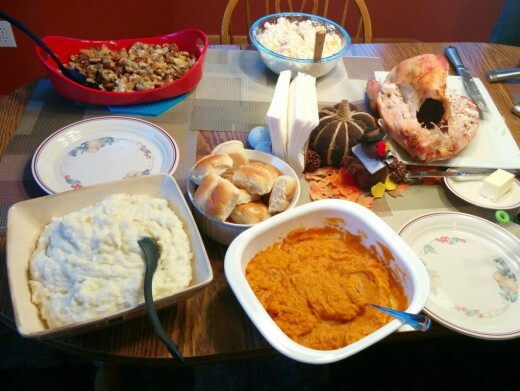 The funny part of this story is my husband forgot to inform our friends that I was actually making Thanksgiving dinner; they arrived at our place and were completely surprised when I pulled a turkey out of the oven. It’s something I still laugh about to this day. The best part about this silly idea of ours is it has become an annual tradition. Our Friendsgiving with the Schoppes is something I always look forward to; Kellie and I prepare the menu and we enjoy a feast together the week before Thanksgiving. At our second annual event, we had two special guests join us. My husband’s company has a manufacturing facility in China; he traveled to Beijing twice and worked closely with the software team over there. Several of his co-workers from China have also visited the United States and the facility in Minnesota. Two were visiting during Friendsgiving so we invited them over to join us. It was fun introducing them to American traditions and watching them eat turkey for the first time; I’ll always have fond memories of that year! 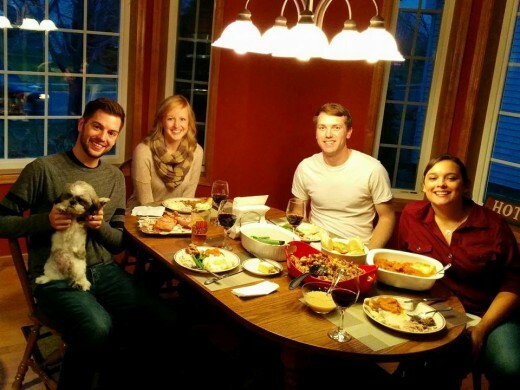 Last weekend we celebrated our 4th annual Friendsgiving at Kellie and Dan’s. I knew hosting would be a little more challenging this year with our upcoming trip to Europe and move to Seattle, so Kellie took over the hosting duties and made a majority of the food. Everything was delicious and we had a great time as always! 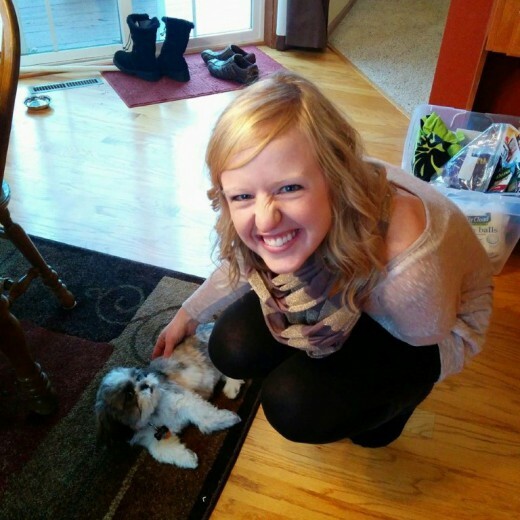 Kellie and Dan’s new dog, Millie, also made her first appearance at Friendsgiving this year. I realized that I now want a little puppy! 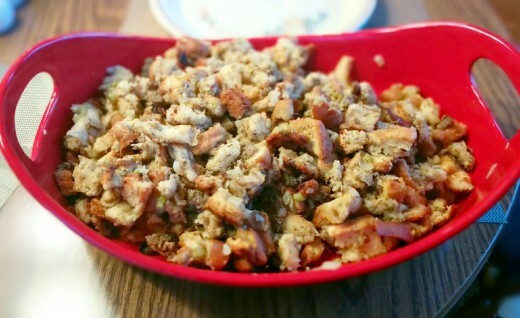 Although I didn’t do as much for the food prep this year, I still was able to bring the stuffing! 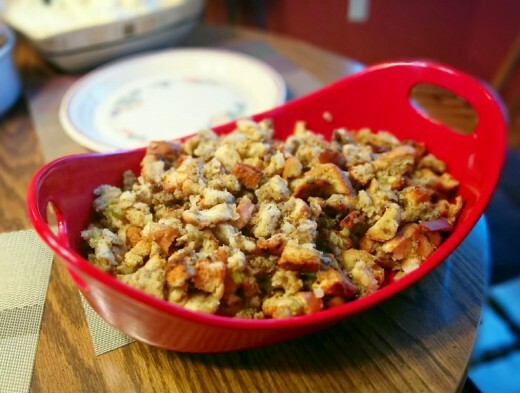 My stuffing recipe has been apart of my family’s Thanksgiving meals for several years. 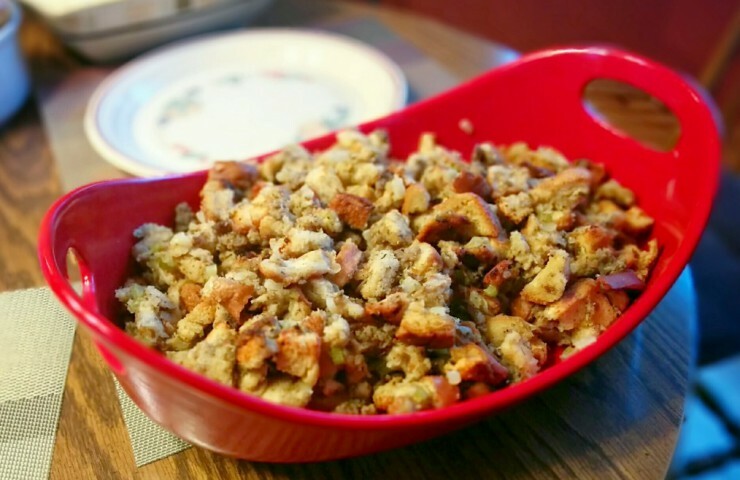 I tend to modify it slightly every year, but it’s by far my favorite recipe at Thanksgiving! Begin by preheating the oven to 400ºF. Use a serrated bread knife to cut the bread into cubes. 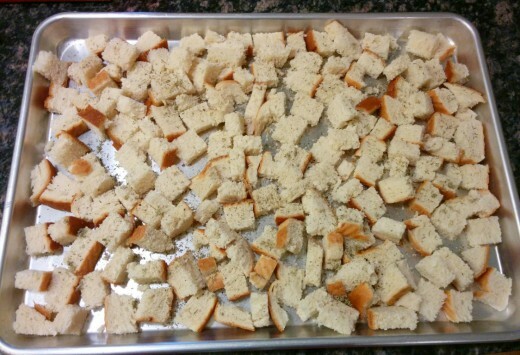 One full loaf of bread will yield about 12 cups of cubes. Arrange the bread cubes on a cookie sheet in a single layer. Depending on the size of your cookie sheets, you may need to use 2 or 3. 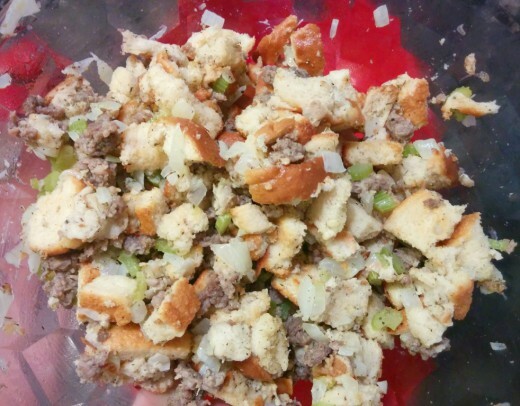 Season the bread cubes with 1 teaspoon sage, 1/2 teaspoon thyme, 1/2 teaspoon salt and 1/2 teaspoon pepper. 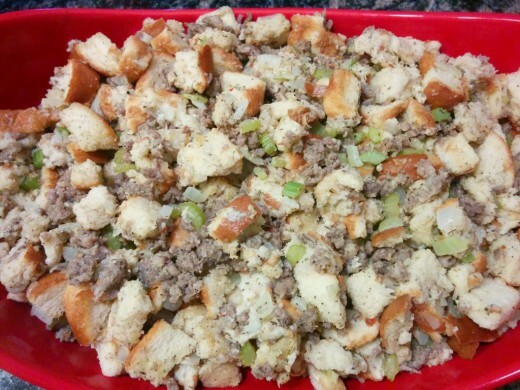 Place in the oven and toast for 5 to 7 minutes, until the bread cubes are slightly crunchy. Reduce heat to 325ºF. 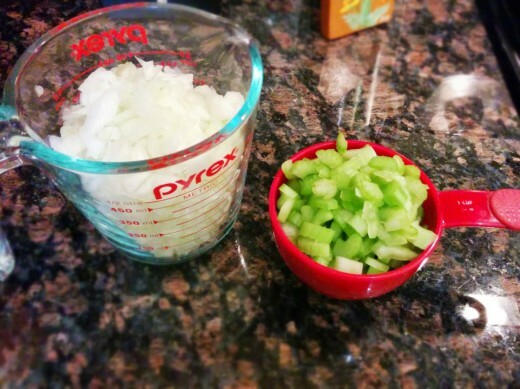 Transfer the cubes to a large bowl. In the meantime, heat the butter in a medium-sized skillet over medium heat. 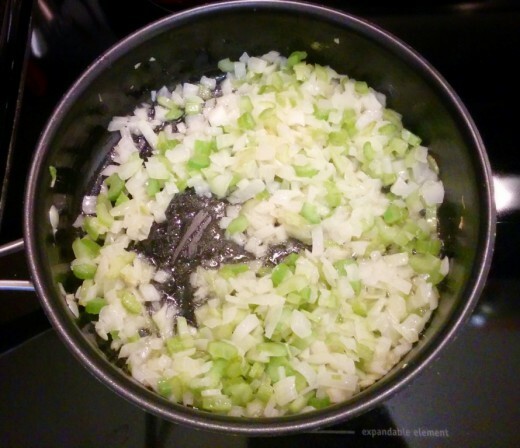 Add celery and onions and saute until soft. 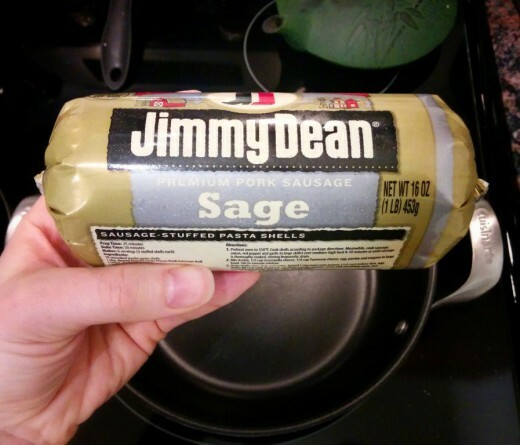 In another skillet, brown sage sausage over medium heat until fully cooked through. 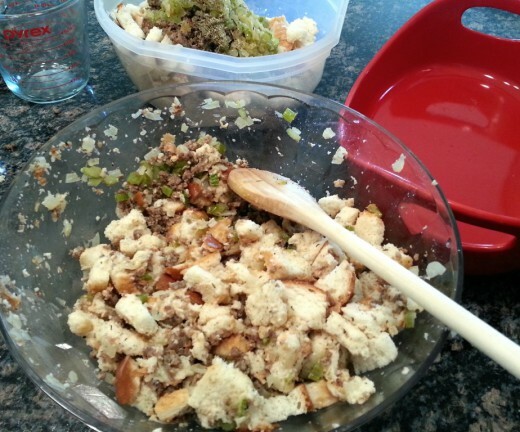 Transfer the celery and onion along with the cooked sausage to the bread cubes. Pour the chicken broth into the bowl and add the remainder of sage, thyme, salt and pepper. 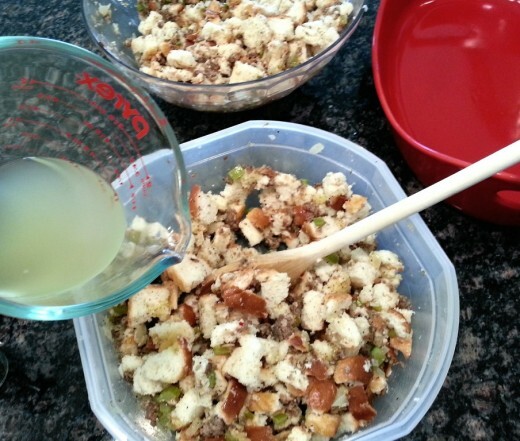 Transfer the mixture to a 9″ x 13″ pan, or use my favorite Rachael Ray bakeware set! Cook uncovered for 20 to 25 minutes. Serve immediately and enjoy! Preheat oven to 400°F. 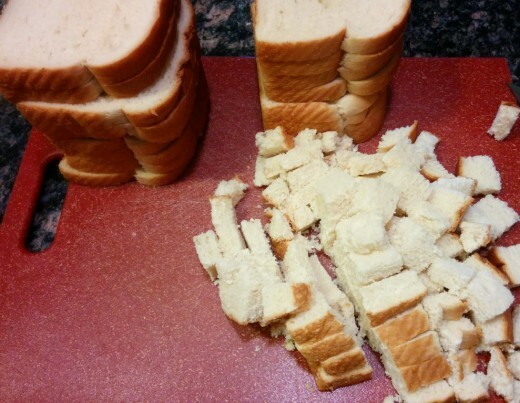 Using a serrated bread knife, slice bread into cubes. Arrange in a single layer on a baking sheet and season with sage, thyme, salt, and pepper. This usually requires 2 or 3 baking sheets. Work in batches if needed, splitting up the seasonings evenly for each batch. 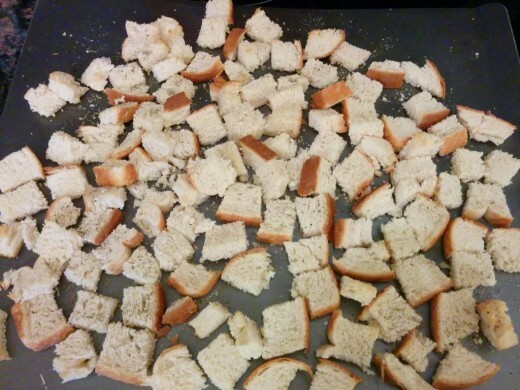 Toast bread for 5-7 minutes, or until slightly crunchy. 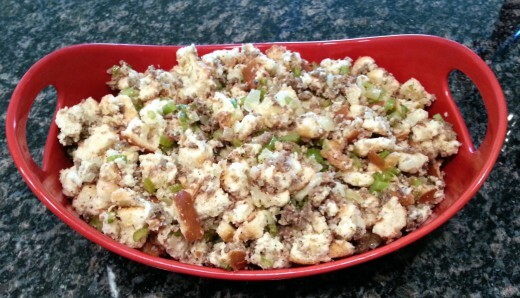 In a large skillet, add butter, onion and celery and saute until soft. 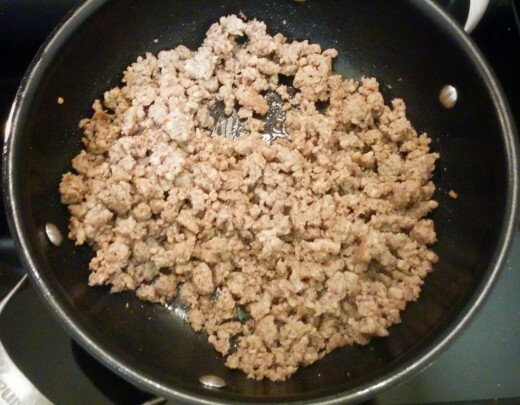 In a separate skillet, add the sausage and cook until completely browned. 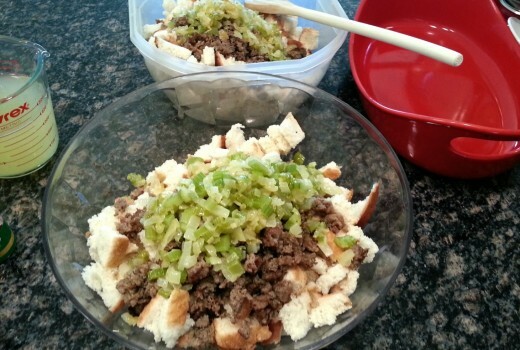 In a large mixing bowl (or two if needed), add toasted bread cubes, sauteed celery and onion, and browned sausage. Add in chicken broth, sage, thyme, salt and pepper and mix well. Transfer to a baking dish and bake uncovered for 20-25 minutes.